Ezra is the most likely author of this book. Jewish tradition held that Ezra wrote 1 and 2 Chronicles, Ezra, and Nehemiah (Baba Bathra 15a). He was the descendant of Aaron the high priest, and therefore, he was from a priestly class (Ezra 7:5). He was “well versed” in the Bible, and therefore, literate and scholarly (v.6). Ezra probably wrote most of this book. Notice his use of the first person “I” in Ezra 7-10.
Who were Ezra and Nehemiah? Ezra and Nehemiah served in Israel after the Exile at the same time. Ezra was a priest and scribe. He led the spiritual revival in Israel. Because he was a Levitical scribe, he may have “held a position akin to secretary or counsel for Jewish affairs in the royal cabinet (cf. Ezra 7:1-6).” He arrived in Israel 12 years before Nehemiah in 457 BC (the seventh year of Artaxerxes; Ezra 7:8). Nehemiah was an administrator. He was responsible for the physical protection of Israel, rebuilding the protective walls. He was a cupbearer in King Artaxerxes’ court (Neh. 2:1-2). He arrived 12 years after Ezra in 444 BC (the twentieth year of Artaxerxes; Neh. 1:1). Nehemiah knew of Ezra, and he is mentioned in his book (Neh. 8:2). What is the historical context of these books? Ezra and Nehemiah pick up after the Babylonian Exile. The book of Kings ends with the Jewish people being taken into Exile (587-586 BC). Ezra and Nehemiah describe how the Jewish people regathered into their land, rebuilt the second Temple, and reformed their nation against all odds. Even though many Jews existed at this time, only a “remnant” of 50,000 returned (Ezra 2:64ff; cf. Isa. 10:22). Which non-Jewish kings were in power during this time? The Persian King Cyrus (son of Cambyses I) gave orders for the Jewish people to rebuild their Temple (Ezra 1:1). King Cyrus (Cyrus II) overthrew Astyages (549 BC), and he became the Persian emperor who founded the Achaemenid dynasty. He even ruled over Babylonia from 539-530 BC (fulfilling Isa. 44:28; 45:1ff). Achtemeier writes, “Cyrus’s military victories eventually put him in possession of the largest empire the world at that time had yet seen.” Cyrus died in battle in 530 BC, but his dynasty ruled over Babylon for two centuries (until Alexander the Great conquered them). The Cyrus Cylinder attests to Cyrus’ rule. Geisler and Holden write, “The sixth-century BC Cyrus Cylinder, which many have recognized as the first charter of human rights, is a clay record written in Babylonian cuneiform of Cyrus’s victory over Babylon. Worthy of note, the cylinder gives permission to worship freely and to rebuild destroyed cities and worship centers. Though the Jews were not mentioned by name in the cylinder, they were free to return to their homeland that lay in ruins.” This syncretistic policy supports the biblical account of Cyrus being moved to let the Jewish people return home. Cambyses II (the son of Cyrus II and grandson of Cambyses I) took over the throne after his father’s death, conquering Egypt and murdering his brother Smerdis to secure the Persian throne. Darius I (521-486 BC) succeeded Cambyses, and the Bible mentions him in several books (Ezra 4-6; Haggai; Zech. 1-8). It was during Darius’ reign (520 BC) that Haggai and Zechariah came on the scene as prophets (Ezra 5-6). Xerxes (also called Ahasuerus) took over the Persian throne from 486-465 BC (Ezra 4:6). Artaxerxes I (also called Longimanus) was the son of Xerxes, and he ruled from 465-423 BC. He enters the biblical narrative in Ezra 7 and in the book of Nehemiah. Artaxerxes made Nehemiah the governor of Judah in 444 BC, giving him the decree to restore and rebuild Jerusalem (Neh. 2:1-8; Dan. 9:25). What is Ezra and Nehemiah all about? While Nehemiah describes how God restored his physical kingdom to Israel (the wall, the defenses, the city, etc. ), Ezra describes how God restored his spiritual kingdom to Israel (the Temple, the sacrifices, the priests, etc.). These books explain how the Jews got back into their land, restored their collective faith, and repaired their city walls from their enemies. Ezra picks up the story where 2 Chronicles left off. (Ezra 1:1) Why were the Jews exiled? (1:1) The first year of King Cyrus is dated to 538 BC. Cyrus was “stirred” to make this proclamation in the same way that he “stirred” the Jewish exiles to return (v.5). This fulfilled the prophecy of Isaiah 44:24-45:13 about Cyrus defeating the Babylonians. This also fulfilled Jeremiah’s prophecy of ending the Exile after 70 years (Jer. 25:12ff; 29:10ff). While it had only been ~50 years since the Exile (586 BC), this proclamation set the regathering in motion. Josephus claims that Cyrus had seen the prophecy of Isaiah about him (Isa. 44:28; Josephus, Antiquities, 11.1). However, there is no other corroboration to support Josephus’ claim. (1:4) The “exodus” back to the Promised Land is accompanied by gifts of silver and gold, which is reminiscent of the original Exodus (Ex. 12:35-36). (1:5) God was working both ends toward the middle: stirring Cyrus and stirring the Exiles at the same time. (1:6) See comments on verse 4. (1:7) Cyrus returned the loot that Nebuchadnezzar had plundered from the Temple. (1:8) The name Mithredath literally means, “Mithras has given,” which refers to Mithras the sun god. Sheshbazzar could also be understood to be a “ruler,” rather than a royal prince. (1:9-11) Imagine what it would feel like to see this money returned to your nation, after being in exile for half a century. The Jewish people must have been speechless to see God’s prophecy coming to fruition. God is sovereign. He can stir the heart of the king to do whatever he wants. God is in charge of the world, and he will direct history and individuals sovereignly, as he wishes for his good purposes. In the book of Daniel, God made Nebuchadnezzar moo like a cow out in the wilderness (Dan. 4). Solomon writes, “The king’s heart is like channels of water in the hand of the LORD; He turns it wherever He wishes” (Prov. 21:1). The people were helpless. They couldn’t rebuild their Temple. Instead, this was a sovereign act of God. Perhaps God waited this long to show the people how badly they needed him—to show them their utter helplessness before he displayed his power and faithfulness. God fulfilled his promises literally. Daniel, Chronicles, and Ezra all believed that God would literally fulfill his promise to bring his people back into the land, and he made good on this promise. When we study eschatology, we should likewise look for literal fulfillments—unless there are good and sufficient reasons to take another interpretation. (2:1-58) Since Ezra was a scribe, he meticulously notes the individuals who made the return. This shows that the people still had an identity and family background intact. (2:59-62) A few families do not have their genealogical registration, so they were asked to wait on a priest to confirm them. They had just been kicked out of the land for disobeying the covenant. They wanted to make sure that their first few days back in the land were not already breaching it. (2:63) The priest used the Urim and Thummim to determine their ancestry, since they lacked any hard evidence. (2:64-65) When added together, the people only numbered around 50,000 in total. (2:66-67) Ezra even numbered the livestock. (2:68-70) The people returned to their homeland, but they still lacked a working Temple. The leaders of the families collected voluntary money to help fund the rebuilding of the Temple. (3:1) The “seventh month” was Tishri (September-October). The first day of Tishri is New Year’s Day (Rosh Hashanah). “the people gathered together as one man…” This represents their unity as a nation after their terrible fall. (3:2) Jeshua was the spiritual leader, and Zerubbabel was the political leader. These leaders started by building an altar to God. (3:3) Creating this altar was an act of faith. These Jewish people were afraid of the surrounding people and their vulnerability to their attacks. (Ezra 3:3) Why are the Jews “afraid” if Cyrus has given them the land? (3:5-6) The people started to practice the sacrifices and the festivals before the foundation for the Temple was even laid. This shows that they valued the spiritual acts—even without the structures present. (3:7) The people paid the neighboring nations for materials to start the process of rebuilding the Temple. (3:8-9) The men started to rebuild the Temple in the “second month” which was the same month Solomon began working on the first Temple (1 Kings 6:1). Formerly, the Levites needed to be 25 years old (Num. 8:24) or 30 years old (Num. 4:3), but because of the lack of workers, they dropped the age to 20. Sheshbazzar also helped with laying the foundation for the Temple (Ezra 5:16). (3:10-11) The laying of the foundation was also met with high morale, as the priests blew their trumpets and crashed their cymbals. Others sang with loud voices. They probably wanted to encourage this great work. (3:12) The older men could remember the “glory days” of the first Temple under Solomon. It must have been crushing to see the weak and fragile replacement Temple. This must have been a bittersweet scene to witness, as the old men wept and the young men rejoiced. The psalmist writes, “Those who sow with tears will reap with joyful shouting” (Ps. 126:5). (Ezra 3:12-13) Why are the older men weeping, while the younger are joyful? Why are half of the people cheering and half crying? This is the mixed emotion of repentance. On the one hand, you’re happy to see that God cares for you and accepts you, but you’re sad that the Temple is such a shabby version of what existed before. It’s very easy to focus on the “glory days” and weep like these old men did. But we need to rejoice in what is currently doing in our midst. They based their joy and happiness off of God’s promises in the word (v.11). This chapter outlines multiple different vignettes where various people and rulers tried to stop the rebuilding of the Temple. This is not a strict chronology. That is, Ezra arranged this material topically, rather than chronologically, to record the opposition the people encountered. (4:1-2) These “enemies” may have been the Samaritans, because they were in some sense related to the Assyrians. These Samaritans were known to be syncretistic. (Ezra 4:2) Why does Zerubbabel turn down this offer from the non-Jewish men in Israel? (4:3) The leaders discerned that these people did not share their theological commitments or convictions. They relied on God’s will, as well as Cyrus’ decree for them to rebuild. (4:4) The enemies did not take this news well. They started to use scare tactics to stop them from building. The term “frightened” (bālah) was usually used in battle (Judg. 20:41; 2 Sam. 4:1; 2 Chron. 32:18; Dan. 11:44; Zech. 8:10). This only confirms the discernment of the leaders (v.3). (4:5) The enemies of Israel had hired prophets to attack the Israelites before (e.g. Balaam; Deut. 23:4-5). These scare tactics lasted all the way through the reign of Darius I. (4:6) Ahasuerus could be Xerxes (the Persian king who reigned during the time of Esther). Since the leaders of Israel appealed to their decree from Cyrus (v.3), perhaps these enemies tried to overturn the decree under Xerxes. Ezra flashes forward to opposition that the Jewish people faced concerning the rebuilding of the “city” and “walls” of Jerusalem. This is not contradictory to the statement in verse 24 that work continued under Darius I (520 BC). This excursus doesn’t refer to the Temple, but to the city of Jerusalem. (4:8-10) Rehum the commander and Shimshai the scribe conspired together to accuse the Jewish people. (4:11-16) These men slandered the Jews for rebuilding a “rebellious and evil city” (v.12). They charged that the Jews wouldn’t pay taxes (v.13). They argued that the Jews had been trouble in the past, and that was why they were attacked (v.15). (4:17-22) Artaxerxes looked into the history of the Jewish people, and he realized that some of the charges had legitimacy. The Jews wanted to be a sovereign nation after all. He issued a cease-and-desist order on the rebuilding of the city. Later, Artaxerxes changed his mind and allowed Nehemiah to return and rebuild the city (Nehemiah 2). Just imagine being a contractor for a building project. As you gather your workers to break ground, a brownnoser from the city comes in and demands building permits and everything comes to a halt! How frustrating! (4:24) After the long digression listed above, Ezra returns to his original point. The Jewish people couldn’t resume their work until the second year of Darius I. This would’ve been in ~520-519 BC. The Temple was completed during this time (see Hag. 1-2). Sometimes in ministry, it seems expedient to allow carnal people to do what they want in the work of God (e.g. teach, lead, get their way, etc.). Don’t give in! This is not the way to lead the people of God! Often, you’ll pay a price for doing what’s right. That’s okay. Don’t take short cuts. (5:1) Haggai the prophet preached from August to December in 520 BC (Hag. 1:1; 2:1-9, 20-23). About two months into Haggai’s ministry, Zechariah joined Haggai to stir the people to build the Temple (Zech. 1:1). (5:2) Zerubbabel’s was Babylonian in origin (meaning “seed of Babylon”). He was the grandson of Jehoiachin (Jeconiah), who was the second to last king of Judah (1 Chron. 3:17). Jeshua was the priest who initially teamed up with Zerubbabel to build the altar (Ezra 3:2). It’s interesting to note that the prophets (Haggai and Zechariah), priests (Jeshua), and kings (Zerubbabel) were all working in concert with one another to accomplish their mission. (5:3-5) Tattenai and Shethar-bozenai were most likely Persian—not Babylonian—officials. They tried to stop the building of the Temple, but the Jews countered by asking them for their official paperwork from Darius. Until they could produce the papers, the Jews would continue building. (5:6-17) Tattenai and Shethar-bozenai sent a letter to Darius. They explained the Jewish history of the destruction of the Temple, and they mentioned the decree which was given under King Cyrus. The Jews had implored Darius (via these messengers) to search the Persian archives to find Cyrus’ decree. Note that the Jews based their authorization on God (first) and King Cyrus (second). They based their authorization on God. Since the prophets told them to rebuild the Temple, they went ahead with it. Compare God’s role versus the people’s role. They just had to be responsive to God and pick up the bricks and rebuild. They couldn’t protect themselves against Cyrus or Darius. Instead, they just had to act in faith. Similarly, we can’t change people’s hearts, battle Satan, etc. We have to trust in faith that God is going to do the heavy lifting. Even though the people didn’t have all of the political authorization perfectly in order, they tried to work with Tattenai. Also, they didn’t let this stop them from moving forward with God’s work. (6:1) History records that there were many Persian archives like this kept in Persepolis. (6:2) Ecbatana was the capital of Media (which was under Persian rule). (6:3-5) Darius found Cyrus’ decree, and it confirmed the story from the Jewish people. (6:6-10) Therefore, Darius reaffirmed Cyrus’ decree, and he told Tattenai and Shethar-bozenai to continue to finance the rebuilding of the Temple. (6:12) Darius concluded his response by reaffirming Cyrus’ decree—only with even stronger language and protection. (6:13) Tattenai and Shethar-bozenai carried out Darius’ orders. (6:14) This verse blends all of the conflating reasons for the rebuilding of the Temple: the preaching of the prophets, God’s sovereignty, and the decrees of Cyrus, Darius, and Artaxerxes. (6:16-18) The people celebrated the finishing and consecrating of the Temple, giving sin offerings and reinstating the Levitical priesthood. (6:19-22) All of the exiles hadn’t practiced the Passover for years. This was a joyous moment, because they hadn’t been able to practice such a central festival. The people reveled at God’s sovereignty over the hearts of the kings to allow for this to be possible. God played an active role in changing Darius’ attitude (v.22). (7:1) This surely refers to Artaxerxes I, which would date this event in 458-457 BC. This means that ~60 years had passed since the rebuilding and consecration of the Temple. (7:2-5) Ezra descended from Aaron—the first high priest (v.5). (7:6) Ezra had been in the Babylonian Exile. However, these circumstances didn’t stop him from becoming skillful and knowledgeable in the Law. (7:7-9) Ezra travelled with other Israelites and priests to Jerusalem. (7:10) Ezra wasn’t just a scholar and practitioner; he was also a teacher of the Law (cf. Neh. 8). (Ezra 7:12-26) Why would a Pagan king desire to give so much to Ezra and the Hebrews? (7:11-26) Some scholars believe that this decree (in 458 BC) is the decree that should be used for the prophecy of Daniel 9. However, Daniel 9 refers to the rebuilding of the “city” of Jerusalem, while this decree refers to the rebuilding of the Temple (“the house of God,” v.23; “the house of the Lord,” v.27). Artaxerxes supplies Ezra with the supplies and the authority to reinstate the Mosaic Law in Israel. (Ezra 7:27) Why does this letter switch to the first person? (7:27-28) Ezra gives thanks to God for putting this decree in the king’s heart. Ezra felt strengthened to continue to carry out his work. God backed Ezra because he put the word into practice (v.10). We get our spiritual strength by understanding (and teaching!) the word. Ezra was a strong teacher. God changed the king’s heart (v.27). Ezra had courage because he knew God’s power was with him (v.28). (8:1-14) Ezra obviously didn’t return from the Babylonian Exile alone. As a scribe, he diligently recorded each and every family line. This registry only counted the males—not the females. So, this was likely a larger group. (8:15) We are not sure which river this is. It could be the Tigris or the Euphrates. (8:16) There were three Elnathan’s in this one group (!). (8:18-20) Ezra brought roughly 40 Levites with him. (8:21) “Fasting” was a sign of “humbling” yourself before God (cf. Ps. 35:13). Ezra knew that he was entering into dangerous territory, and he also knew that only the power and protection of God would suffice for their mission to be successful. (8:22-23) The trip from Mesopotamia to Palestine was incredibly dangerous. When Nehemiah made this trip (13 years later), he had an armed guard to protect him (Neh. 2:9). Why did Ezra make such a brash statement about God’s protection? We are not sure, but God honored it. Ezra was more concerned about God’s reputation, than he was of losing his money or his life. Ezra didn’t want to ruin his witness to the people who heard him earlier. As it turns out, God protected Ezra’s company from the bandits and thieves (v.31). (8:24-30) Ezra’s company of Levites had a considerable amount of precious metals for the Temple. (8:31-32) This implies that “ambushes” were made, but God protected these men and their money as they made this trip to Jerusalem. (8:33-34) The money made it to the Temple in Jerusalem. It was reweighed there, and all of it was accounted for. This shows why Ezra weighed the money in advance: he wanted to make sure that none of it went missing along the way (i.e. none of the priests were skimming off the top). (8:35-36) In addition to the money, the people of Israel made many sacrifices to God during this time. This chapter shows incredible faith in God—despite the grave dangers that his company faced. It also shows that Ezra cared more about God’s reputation, than he did about his personal safety. (9:1-2) The priests intermarried with the Canaanites. Remember, these were the same people whom God had displaced or destroyed during the time of Joshua. The priests may have justified this because there was a scarcity of Jewish women who had returned. Remember, only the males were recorded above, which could imply that women were not as high of a population. (9:3) Ezra pulled out his hair, which is a unique demonstration in the Bible—though it occurs in the extrabiblical literature (Esther 14:2). When Nehemiah heard about the intermarriage, he pulled out the hair of the other people (Neh. 13:25), not his own. (9:4) The Jews had just returned after failing God’s law. Now, they were seeing history repeat itself—almost immediately! It’s no wonder that the people “trembled” at God’s word that day. (9:5-7) Ezra prays a prayer of confession and contrition. Notice that he includes himself in this corporate confession (“we”). (9:8-9) Ezra acknowledges God’s grace toward them. (9:10-12) This “quotation” is really a collation of various verses from the OT. Yamauchi writes, “Verses 10–12 are not drawn from a single quotation but from many passages (Deut 11:8–9; Prov 10:27; Isa 1:19; Ezek 37:25).” The point of Ezra’s prayer is that they have clearly broken God’s commandment: in the law, in the wisdom literature, and in the prophets. (9:13-15) Ezra places himself among the remnant, completely throwing himself on the grace of God. 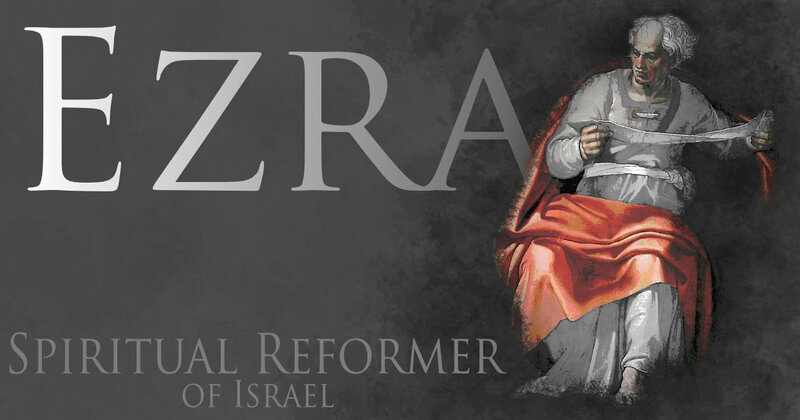 Ezra was a spiritual leader, so he focused on the spiritual needs of the group. He came before the nation as a man of prayer, rather than as a politician. This chapter shows that leadership can be a power for good or bad. The Levites abused their leadership to corrupt the nation, but Ezra used his leadership to intercede for the nation. (10:1) Ezra’s public faith had a magnetic effect. All of the sudden, many people drew toward him, weeping and praying with him. Spiritual leadership is often this way. God uses the life of one person to have an impact on many. (10:2-4) One of the priests—Shecaniah—confessed his sin to Ezra. He wanted to correct this sin by divorcing the wives. The errant priests wanted to make sure that Ezra agreed with this plan before he did anything rash (v.4). (10:5) Ezra made the priests take this oath to divorce the women and put away the children. (10:6) Even though Ezra took action, he was still mourning the state of the nation. (10:7-11) Ezra called for all of the people involved to come forward within three days. Otherwise, they would be removed from the nation entirely. Ezra called on the men to confess and divorce their wives. (10:12-14) The people publicly confessed and agreed. There was so much intermarriage that it took time for all of the men to act on this. (10:15) It isn’t clear why these four men disagreed with the call for corporate divorce. (10:16-17) The others divorced their wives, and Ezra led an investigation afterwards just to make sure that this was the case. (10:18-44) The rest of the chapter lists the names of the men who had intermarried. The final verse states that some of the men even had children with them (v.44). Ezra’s model of leadership influenced the other people (v.1). He speaks later (v.10), but they followed his example first. They took a radical solution to fit with their repentance. Why does this book end on such a dour note? It could be that Ezra was showing the high cost of keeping Israel morally and spiritually committed to God after the Exile. While the people were sinful, they needed to cling to God’s covenant—especially after seeing a brutal 70 year punishment for breaking it. Hill, Andrew, & Walton, John. A Survey of Old Testament Introduction (2nd Ed.). Grand Rapids, MI. Zondervan. 2000. 267. Yamauchi writes, “The books now called Ezra and Nehemiah were known under the single title of Ezra in the earliest Hebrew MSS from the tenth century till the fifteenth century… Josephus (Contra Apion I, 40 ) and the Talmud (Baba Bathra 15a) also refer to the Book of Ezra, but not to a separate Book of Nehemiah.” Yamauchi, Edwin. Ezra-Nehemiah. In F. E. Gaebelein (Ed. ), The Expositor’s Bible Commentary: 1 & 2 Kings, 1 & 2 Chronicles, Ezra, Nehemiah, Esther, Job (Vol. 4). Grand Rapids, MI: Zondervan Publishing House. 1988. 572. Achtemeier, P. J., Harper & Row and Society of Biblical Literature. (1985). In Harper’s Bible dictionary (1st ed., p. 200). San Francisco: Harper & Row. Joseph Holden and Norman Geisler, The Popular Handbook of Archaeology and the Bible (Eugene, OR: Harvest House Publishers, 2013), 279. Kidner, D. (1979). Ezra and Nehemiah: An Introduction and Commentary (Vol. 12, p. 19). Downers Grove, IL: InterVarsity Press. Kidner, D. (1979). Ezra and Nehemiah: An Introduction and Commentary (Vol. 12, p. 22). Downers Grove, IL: InterVarsity Press. Weinberg, Saul. Post-Exilic Palestine: An Archaeological Report (Jerusalem: Israel Academy of Sciences and Humani ties, 1969), pp. 6–7. Cited in Yamauchi, Edwin. Ezra-Nehemiah. In F. E. Gaebelein (Ed. ), The Expositor’s Bible Commentary: 1 & 2 Kings, 1 & 2 Chronicles, Ezra, Nehemiah, Esther, Job (Vol. 4). Grand Rapids, MI: Zondervan Publishing House. 1988. 568. Kidner, D. (1979). Ezra and Nehemiah: An Introduction and Commentary (Vol. 12, p. 34). Downers Grove, IL: InterVarsity Press. Kidner, D. (1979). Ezra and Nehemiah: An Introduction and Commentary (Vol. 12, p. 35). Downers Grove, IL: InterVarsity Press. Kidner, D. (1979). Ezra and Nehemiah: An Introduction and Commentary (Vol. 12, p. 36). Downers Grove, IL: InterVarsity Press. Kidner, D. (1979). Ezra and Nehemiah: An Introduction and Commentary (Vol. 12, p. 37). Downers Grove, IL: InterVarsity Press. Yamauchi, E. (1988). Ezra-Nehemiah. In F. E. Gaebelein (Ed. ), The Expositor’s Bible Commentary: 1 & 2 Kings, 1 & 2 Chronicles, Ezra, Nehemiah, Esther, Job (Vol. 4, p. 621). Grand Rapids, MI: Zondervan Publishing House. Yamauchi, E. (1988). Ezra-Nehemiah. In F. E. Gaebelein (Ed. ), The Expositor’s Bible Commentary: 1 & 2 Kings, 1 & 2 Chronicles, Ezra, Nehemiah, Esther, Job (Vol. 4, p. 626). Grand Rapids, MI: Zondervan Publishing House. Yamauchi, E. (1988). Ezra-Nehemiah. In F. E. Gaebelein (Ed. ), The Expositor’s Bible Commentary: 1 & 2 Kings, 1 & 2 Chronicles, Ezra, Nehemiah, Esther, Job (Vol. 4, p. 627). Grand Rapids, MI: Zondervan Publishing House. Yamauchi, E. (1988). Ezra-Nehemiah. In F. E. Gaebelein (Ed. ), The Expositor’s Bible Commentary: 1 & 2 Kings, 1 & 2 Chronicles, Ezra, Nehemiah, Esther, Job (Vol. 4, p. 629). Grand Rapids, MI: Zondervan Publishing House. Yamauchi, E. (1988). Ezra-Nehemiah. In F. E. Gaebelein (Ed. ), The Expositor’s Bible Commentary: 1 & 2 Kings, 1 & 2 Chronicles, Ezra, Nehemiah, Esther, Job (Vol. 4, p. 633). Grand Rapids, MI: Zondervan Publishing House. Yamauchi, E. (1988). Ezra-Nehemiah. In F. E. Gaebelein (Ed. ), The Expositor’s Bible Commentary: 1 & 2 Kings, 1 & 2 Chronicles, Ezra, Nehemiah, Esther, Job (Vol. 4, p. 634). Grand Rapids, MI: Zondervan Publishing House. Yamauchi, E. (1988). Ezra-Nehemiah. In F. E. Gaebelein (Ed. ), The Expositor’s Bible Commentary: 1 & 2 Kings, 1 & 2 Chronicles, Ezra, Nehemiah, Esther, Job (Vol. 4, p. 636). Grand Rapids, MI: Zondervan Publishing House. Yamauchi, E. (1988). Ezra-Nehemiah. In F. E. Gaebelein (Ed. ), The Expositor’s Bible Commentary: 1 & 2 Kings, 1 & 2 Chronicles, Ezra, Nehemiah, Esther, Job (Vol. 4, p. 641). Grand Rapids, MI: Zondervan Publishing House. Yamauchi, E. (1988). Ezra-Nehemiah. In F. E. Gaebelein (Ed. ), The Expositor’s Bible Commentary: 1 & 2 Kings, 1 & 2 Chronicles, Ezra, Nehemiah, Esther, Job (Vol. 4, p. 644). Grand Rapids, MI: Zondervan Publishing House. Yamauchi, E. (1988). Ezra-Nehemiah. In F. E. Gaebelein (Ed. ), The Expositor’s Bible Commentary: 1 & 2 Kings, 1 & 2 Chronicles, Ezra, Nehemiah, Esther, Job (Vol. 4, p. 645). Grand Rapids, MI: Zondervan Publishing House. Yamauchi, E. (1988). Ezra-Nehemiah. In F. E. Gaebelein (Ed. ), The Expositor’s Bible Commentary: 1 & 2 Kings, 1 & 2 Chronicles, Ezra, Nehemiah, Esther, Job (Vol. 4, p. 646). Grand Rapids, MI: Zondervan Publishing House. Yamauchi, E. (1988). Ezra-Nehemiah. In F. E. Gaebelein (Ed. ), The Expositor’s Bible Commentary: 1 & 2 Kings, 1 & 2 Chronicles, Ezra, Nehemiah, Esther, Job (Vol. 4, p. 648). Grand Rapids, MI: Zondervan Publishing House. Yamauchi, E. (1988). Ezra-Nehemiah. In F. E. Gaebelein (Ed. ), The Expositor’s Bible Commentary: 1 & 2 Kings, 1 & 2 Chronicles, Ezra, Nehemiah, Esther, Job (Vol. 4, p. 658). Grand Rapids, MI: Zondervan Publishing House. Yamauchi, E. (1988). Ezra-Nehemiah. In F. E. Gaebelein (Ed. ), The Expositor’s Bible Commentary: 1 & 2 Kings, 1 & 2 Chronicles, Ezra, Nehemiah, Esther, Job (Vol. 4, p. 659). Grand Rapids, MI: Zondervan Publishing House. Yamauchi, E. (1988). Ezra-Nehemiah. In F. E. Gaebelein (Ed. ), The Expositor’s Bible Commentary: 1 & 2 Kings, 1 & 2 Chronicles, Ezra, Nehemiah, Esther, Job (Vol. 4, p. 662). Grand Rapids, MI: Zondervan Publishing House. Yamauchi, E. (1988). Ezra-Nehemiah. In F. E. Gaebelein (Ed. ), The Expositor’s Bible Commentary: 1 & 2 Kings, 1 & 2 Chronicles, Ezra, Nehemiah, Esther, Job (Vol. 4, p. 664). Grand Rapids, MI: Zondervan Publishing House. Yamauchi, E. (1988). Ezra-Nehemiah. In F. E. Gaebelein (Ed. ), The Expositor’s Bible Commentary: 1 & 2 Kings, 1 & 2 Chronicles, Ezra, Nehemiah, Esther, Job (Vol. 4, p. 667). Grand Rapids, MI: Zondervan Publishing House.